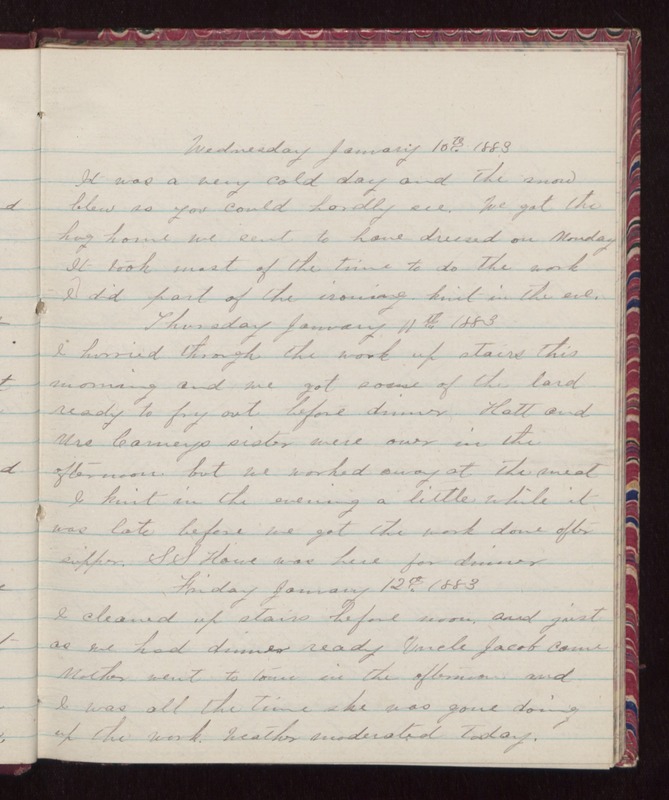 Wednesday January 10th 1883 It was a very cold day and the snow blew so you could hardly see. We got the hog home we sent to have dressed on Monday It took most of the time to do the work I did part of the ironing, knit in the eve. Thursday January 11th 1883 I hurried through the work up stairs this morning and we got some of the lard ready to fry out before dinner Hatt and Mrs Carneys sister were over in the afternoon but we worked away at the meat I knit in the evening a little while it was late before we got the work done after supper. SS Howe was here for dinner Friday January 12th 1883 I cleaned up stairs before noon, and just as we had dinner ready Uncle Jacob came Mother went to town in the afternoon and I was all the time she was gone doing up the work. Weather moderated today.